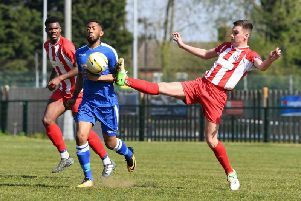 It has been a rollercoaster season for Leighton Town boss Craig Bicknell, but one he has learned a lot from. From personal issues off the field, to footballing mistakes on it, Leighton Town eventually rallied to finish 18th in Evo Stik Division 1 Central. It was a far cry from the countless success he enjoyed at Ampthill Town, and a challenge that proved much harder than Bicknell expected when he took over from Craig Wells at Bell Close last summer. “But with my court case looming at the beginning, I didn’t know whether I should be spending time with my family, or out on the field because I hadn’t done anything wrong. “And then there were injuries, general unavailability, and a few mistakes on my part, tactically. Key men at either end of the field were key though in helping Town beat the drop. Danny Watson, playing often as the lone striker, ended among the league’s top scorers, while goalkeeper Zaki Oualah stepped in midway through the campaign to shore up the defence. Bicknell said: “Danny has been magnificent all season, especially playing up front on his own. “And the keeper too has brought about a huge change. He fell into my lap, and was tired of sitting on the bench elsewhere. “He travels in from Reading for each game, and that just shows the level of dedication he’s shown. “From losing games 1-0 and 2-1, we were turning things around. After finishing 18th in the table, Bicknell says there have been a lot of lessons learned from the season, and that Town will bounce back even better next time out. “Everyone is so passionate about the club, and getting Leighton Town up through the leagues. >> Next Saturday, May 9, Leighton Town are hosting their Player of the Year awards at Bell Close.